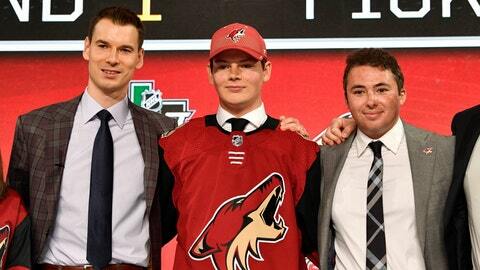 The Arizona Coyotes selected center Barrett Hayton from Sault Ste. Marie (OHL) on Friday with the fifth pick in the 2018 NHL Entry Draft at the American Airlines Center in Dallas. Last season, the 6-foot-1, 190-pound Hayton registered 21-39-60 and 32 penalty minutes (PIM) in 63 games with the Greyhounds. Hayton finished the season with a plus-24 rating and helped his team set single-season franchise records for wins and points in 2017-18. Hayton also registered eight goals and 21 points in 24 postseason contests. Hayton has recorded 30-57-87 and 68 PIM in 126 career games with Sault Ste. Marie. He was awarded the Bobby Smith Trophy as the OHL Scholastic Player of the Year in 2017-18. The 18-year-old native of Peterborough, ON helped Canada win the gold medal at the 2017 Ivan Hlinka Memorial and shared the team lead with three goals in five games.